“EV BATTERY TECH 2019 Exhibition and Conference is the Premier Forum for Battery Technologies for Electric Vehicle Manufacturers, where electric vehicle battery technology innovators will meet with leading automotive manufacturers in Frankfurt to explore new battery technologies and battery management systems for use in next generation electric vehicles and hybrid electric vehicles. 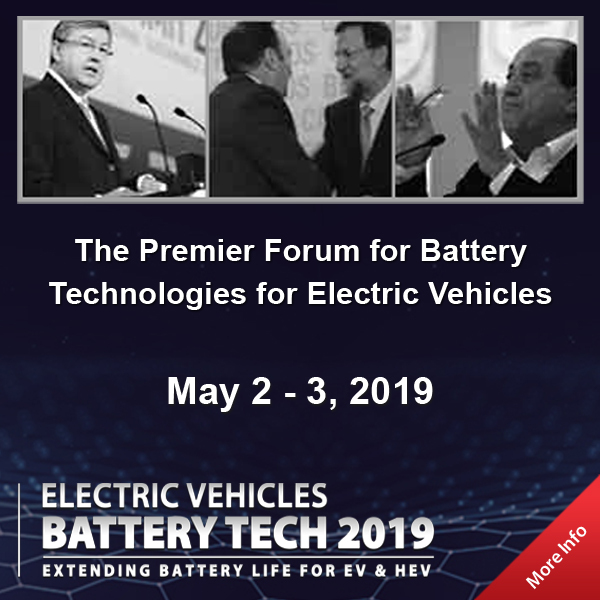 This year’s EV BATTERY TECH 2019 is set to become the world’s leading exhibition and conference exclusively for battery technology innovators and manufacturers, to meet and collaborate with a large array of automotive manufacturers, and to examine new methods and technical know-how to address the specific challenges associated with extending battery life for next generation electric vehicles. This exhibition and conference will provide a forum for all stakeholders across the electric vehicles battery supply chain; from suppliers and service providers to equipment manufacturers for the automotive industry, to network and build cross-market relationships and to discuss the real challenges and opportunities in extending drive range and battery life to meet the needs of electric vehicles and hybrid electric vehicles.